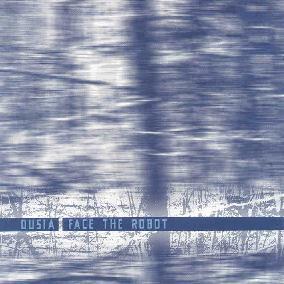 Ousia - "Face The Robot"
Ousia pronounced ooh-see-ah, is a quartet of musicians who delve into a world drenched in what they term as ambient noise drone compositions or 'Snowbient' as it is known to those on the right side of the fence. The band is made up of Paul Horn on guitar, keyboards, 309 and radio, Dave Onnen on bass, Jason S. Shapiro on keyboards and sampler, and Fred Teasley on guitar and keyboards. Together they produce a definite atmospheric style of non-music that is fast becoming more prominent with many bands in the experimental scene. 'Face The Robot' is an 11 track album that lasts over 50 minutes. Their sound is as they explain it, very ambient noise droning. The prominence lies in synth orientated stuff, the oscillations of heavy based key sounds encapsulate the whole album. The driving atmospheres take meaning as they mould the listeners' ears to adjust to their patterns. All tracks are very ethereal. Tracks like "Robot In", "Ebow Lullabye" and "Sound check" all glide mellow and dreamlike through their course, easily allowing the mind to glimpse a place in time. The Synth Rhythms here are not quite the in-your-face dance beats thankfully, they produce good foundations for the bass to make itself known, very slidey stuff with a lot of delay. "Solar Limen" and "Robot Out" both allow the guitars to take the forefront with mellow picking over the oscillations of heavy synths with good results. There are moments when the pieces drive home almost The Orb or Banco de Gia like stuff; it is an album in the mould of that style. There are a few bands that I could liken Ousia too... Landing in certain respects although not the same musical direction. They produce long pieces that are bound in creation of noise and atmosphere. The Orb and Banco De Gia, as well as Anubian Lights all could have similar outlooks. Tangerine Dream could be mentioned as the pioneers of this genre, as well as other innovators. All in all if you like to be immersed in simplistic noise expansions geared for the headphone listener rather than the party crowd, if you like the more ambient beats rather than in-your-face, Ousia should be checked out. Very mellow and thought provoking. For more information you can visit the Mutant Music web site at http://www.mutantmusic.com.